Whatever your chosen area of study or level of course, your study programme or ‘The Reaseheath Edge’, will give you the advantage when it comes to progressing successfully onto higher level study or into employment. The Reaseheath Edge study programme is designed to off er a challenging and exciting learning journey that not only teaches you the knowledge needed to succeed in your chosen area of study but also wide technical, academic, personal and employability skills. Substantial qualification at level 1, 2 or 3* relevant to your chosen area of study and entry grades. Vocational Programmes will contain a mix of theoretical and practical elements, see course pages for more information. *at level 3 your study programme may be a 1, 2 or 3 year programme, or 2 x 1 year ‘segments’ depending on the size of your qualification chosen and learning goals. Click here for further information. You will be assigned a personal tutor who will work with you throughout the year to support your course and wider needs. English and Maths skills are vital for your successful progression into higher study or employment. If you are yet to achieve GCSE grade C in English or Maths you will be supported to achieve this through attendance at weekly timetabled sessions. Regardless of your grades you will be supported in advancing your English and Maths skills during lectures, tutorials and assessments to ensure you are best prepared for the demands of education and the industry. Click here for more information. 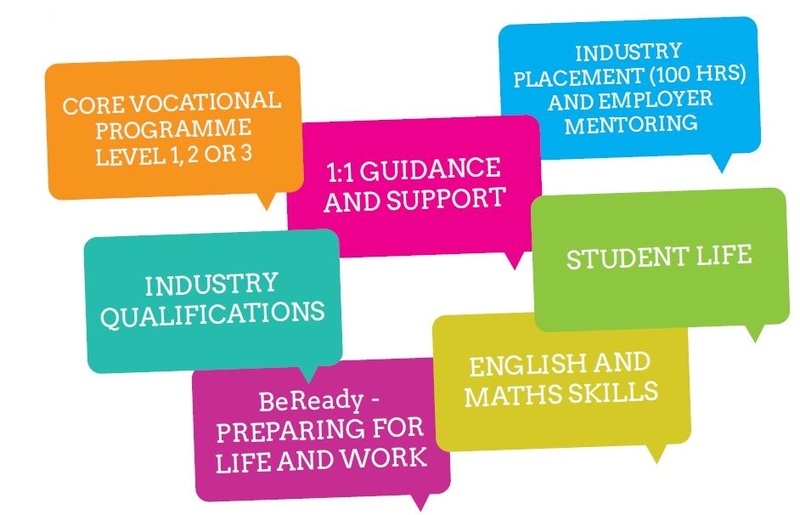 As part of the Reaseheath Edge you will follow the Reaseheath College BeReady Programme that helps you prepare for life and work in today’s society. As part of your study programme you will be supported in finding an industry work placement that you will complete during the academic year (up to 100 hours). The placement will be within an industry relevant to your course and will provide the opportunity to gain valuable employability skills and experience in the workplace. You will also be assigned an employer mentor who is an industry based expert who will make regular contact with you, offering advice and guidance in both course and industry related matters. During your programme you may also have the opportunity to gain industry recognised short qualifications or ‘tickets’. These are often required by employers and may help to increase the chances of employment in the future as they demonstrate industry competency and skill acquisition. When you join Reaseheath College you will become part of the Reaseheath College student body giving you access to the many varied and exciting social and recreational opportunities throughout the year. Click here for more information.